The 22-year old Turkish special operations police officer Mevlut Mert Altintas, who assassinated Russian Ambassador Andrei Karlov in Ankara Monday, Dec. 12, was a member of the Nusra Front, Al Qaeda’s Syrian branch. 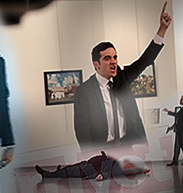 Atlintas approached the ambassador as he gave a speech opening a photo exhibit in the Turkish capital and shot him in the back five times. After yelling “We die in Aleppo, you die here,” he recited sentences from an Arabic prayer which are Nusra’s anthem. He went on shouting "We made an oath to die in martyrdom…it is revenge for Syria and Aleppo." He is believed to have added: "Until they are safe, you will not taste safety. Get back, only death will take me from here." Moscow’s decision to substantially intervene in the Syrian war in September to save the Assad regime was prompted additionally by the outstanding combat performance of the Nusra Front rebels. Furthermore, according to new figures just released in Moscow, 2,000 Russian jihadists were killed on the Syrian front against Assad. debkafile’s sources have found that the majority belonged to the Nusra Front. Its members are being evacuated from Aleppo in large numbers in the last 24 hours, after being driven out of east Aleppo in a bitter defeat. The Nusra chief Mohammad al-Jawlani holds Russia and especially President Vladimir Putin responsible and views them as the group’s nemesis. Since the assassin was killed, it will be difficult to establish whether he acted alone and who his contacts were in Turkey and Syria. It won’t be easy to discover if and how far Turkish Special Forces have been penetrated by Al Qaeda’s Nusra agents. The very fact that one of those agents, a Turk, was admitted to an elite police outfit without being discovered by Turkey’s MIT intelligence service indicates how vulnerable Turkey is to insider attack by radical Islamist organizations. debkafile’s counterterrorism and intelligence sources report that the last three terrorist atrocities perpetrated in the Middle East attest to the increasing audacity of the Islamist organizations, and the incompetence of national counter-terror agencies to cope with this new wave of violence. The Dec. 12, assault on the Coptic cathedral in Cairo, which left 25 dead, was conducted by an ISIS team from Raqqa in Syria, which spent some time in the city without discovery. Sunday, Dec. 18, saw a string of terrorist attacks in Jordan, in which 10 people were killed that were also tied to ISIS. And the next day, Monday, the Russian ambassador to Turkey was assassinated by an operative of Al Qaeda’s Nusra front. Also on Monday, a truck crashed into a Christmas market in Berlin, killing several people, in what appears to be part of the holiday offensive threatened by ISIS in Europe as well as the Middle East. A similar Islamist truck attack in the summer holiday in Nice, the French Riviera, killed 87 people. .